With excitement we present this all-inclusive Christmas Program for your K-6 church or/school children. It was created with options of offering each grade their own “opportunity to shine”, or presenting it in full, by any size choir. Varied needs have been carefully addressed, such as instrumental Processionals and Recessionals for younger students, should their exits be desired. 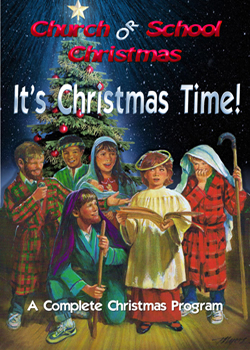 This musical’s vibrant, spirited songs (traditional AND new), can be performed with-or-without the Christmas Story Script, and accompanied by either keyboard or fully-orchestrated Tracks. We trust whatever your specific choices may be, It’s Christmas Time, will offer to you, your children and audience, the most joyful, memorable concert of The Season. Celebrate! Order Trax, Scores, and Single Songs separately below! The audioplayer below now has complete listening tracks - not samples. Play as much of each track as you like!